In the 1930s, the Nesco company began manufacturing cooking and farm accessories, now are part of the Metal Ware corporation. The electric roaster ovens that Nesco first began with long ago still bear the brand name of the company that made these roasters famous. To be quite honest, this Nesco 18 Quart Roaster Oven looks and functions pretty much like the other Nesco roaster ovens we have reviewed. The ivory color appears to be the only real thing that sets this electric roaster oven apart from its brethren. 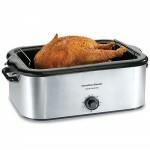 It is the same roomy size and can be used to bake, roast, and even as an extra large slow cooker should the need arise. There seems to be very few reviews for this Nesco Roaster Oven to be found anywhere on the internet. The few reviews that are available do give this roaster oven good ratings and state that it is easy to use and easy to clean. Looking at other similar Nesco roaster ovens, we find that the few ratings for this roaster is on par with others roasters of this size from the same brand that get many more reviews. Perhaps the lack of reviews for this roaster is simply due to the fact that fewer people are looking for an ivory color roaster oven. However, if ivory is your color, then reading the reviews for other 18 Quart Nesco Roaster Ovens should help you to decide if this particular oven will meet your needs.